Stamped Conrcrete, Driveways | Addison, Elmhurst IL | Dependable Concrete, Inc.
Take your new concrete driveway, patio, walk way a step further…jazz it up with color and/or stamping. In addition to our traditional concrete services, we also provide stamped and color concrete as a less expensive and often more beautiful alternative to a complete concrete renovation. With colored concrete, the creative options and color choices are endless, making it possible to achieve the perfect look. 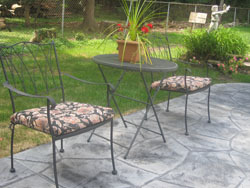 Colored concrete can transform a room or patio from plain to spectacular. Many manufacturers offer a broad palette of colors to choose from, ranging from earth tones to vibrant colors. Also, colored concrete can be used to simulate the look of brick, flagstone, pavers, or tile. Not only is concrete coloring a beautiful design option, but it is also affordable and compatible with both new and existing concrete. With the right products, techniques, and a creative contractor you can produce results that will transform concrete into works of art. At Dependable Concrete, Inc. you can choose from an array of color schemes and/or stamping made available to you from Butterfield Color. Please check out the Uni-Mix Integral Concrete Color, or the Perma-Cast Antiquing Release Color.